If you’re anything like me, you’ve probably spent your first three decades imagining the day your byline will be up in lights in a book shop. But then work (and wine) get in the way and before you know it, it’s been weeks since you’ve moved that blinking cursor. Lately I’ve been using “temptation bundling” to help me get more words on the page – and while the strategy doesn’t necessarily promise better words, it at least makes getting them out a whole lot more fun. I first heard about the concept on the Freakonomics podcast, where Professor Katherine Milkman, an expert in behavioural economics explained that “temptation bundling” is about tying together two activities — one you should do but avoid and one you love to do but isn’t necessarily productive. They use the example of only letting yourself binge watch your favourite TV show when you’re on the treadmill at the gym. It makes you want to work out because you get to find out what Hannah Horvath and the rest of her girls are up to. If you’ve got something you need to get done – whether it’s exercise, creative pursuits or housework – Professor Milkman suggests thinking of activities you could bundle it up with to make it more palatable. For me, that means linking novel writing with beach time, candle burning and tea drinking. When the sun is shining, I can’t resist walking to the beach at the end of my street, however I’m often left feeling guilty for lazing in the sun and not getting through more edits. 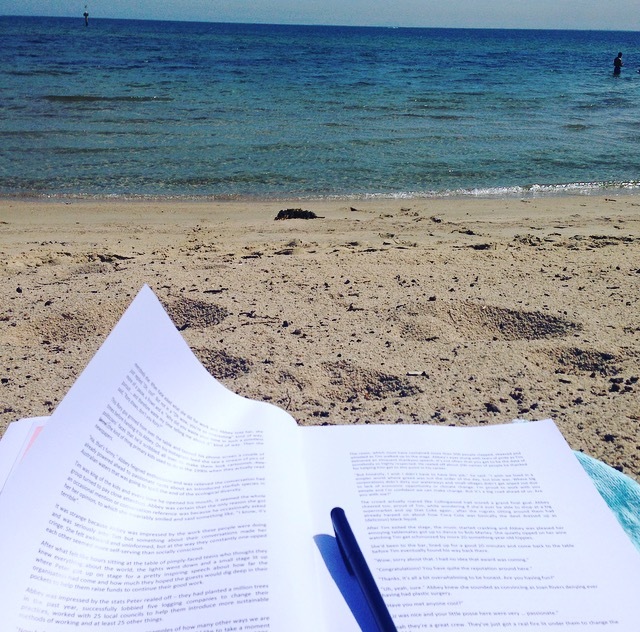 So now I “temptation bundle” my trips to the beach by taking my manuscript to do hand-written edits to the sound of seagulls and lapping waves. Another of my passions is burning beautiful candles – and I’d have them wafting delicious scents through my apartment any day of the week if I could. Now I’ve made a deal with myself to only burn candles when I’m working on my novel, so if the apartment is musty I have to get writing. Green and chai tea are two of my other little luxuries but I won’t let myself buy one from a cafe if I don’t have my laptop in tow to bash out a few sentences. Even if I’m meeting a friend for tea, I’ll try get there early and do 15 minutes of writing to justify the drink.